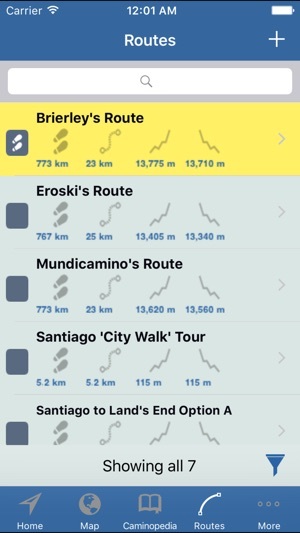 TrekRight – Camino Francés is a comprehensive, incredibly handy mobile app for anyone walking or bicycling the historic Camino de Santiago (specifically, the Camino Francés and the extension from Santiago to Finisterre / Fisterra). TrekRight includes an in-depth reference 'Trekopedia' (communities, albergues, attractions, services, points of interest, etc. ), supports customizable routes, interactive maps (including detailed *offline* maps), directions and section-by-section guide, dynamic trip stats for your current section, stage, and route, an intelligent compass with a built-in yellow arrow that shows the right direction based on your current location and chosen route, and more. Location-aware information – TrekRight provides you with information tailored to your current location. If you are approaching Puente la Reina, TrekRight will tell you how far you still have to go, what attractions are available around you, where you can find a water fountain, options for where to stay the night, easy access to interactive elevation profile charts, and clear, detailed directions. You can easily see what things you flagged as interesting, which things you added notes to, and which you marked as favorites. Real-time information that keeps you completely on top of things! TrekRight’s ‘Camino Encyclopedia’ is packed with extensive interactive reference information, organized into Communities, Shelters, Attractions, Services, Points of Interest, and Route Sections. Everything can be searched and filtered, viewed on a map, notes can be added (anything from a simple reservation number to a copy-and-pasted blurb from a website), and more. Handy information (literally) at your fingertips! Powerful, flexible map that displays your current location on your selected route along with pins showing all the locations included in the Caminopedia (just touch a pin to open its related Caminopedia entry). Easily filter and do searches. Detailed, high-quality offline maps are included, so you have full access to maps even without Internet access. When you do have an Internet connection, online maps are also available which can be configured to show street maps, satellite view, terrain, or a hybrid. Completely transform how you ‘see’ your surroundings on the Camino. In addition to all the standard compass functionality, TrekRight’s intelligent compass also points you in the right direction based on your current location and your selected route, and updates dynamically as you move. Two special compass indicators are available – one points towards the end point of your current section (typically the next town on the route), and the other points which way you should go *now*, taking into consideration your current position and all the twists and turns in your route. Never get lost again! TrekRight makes it easy to plan your route (including configuring the sections you want to follow), organize it into stages, and review distances and elevations (including a handy interactive Elevation Profile Chart). Comes pre-defined with popular routes including those touted by Brierley and Eroski. 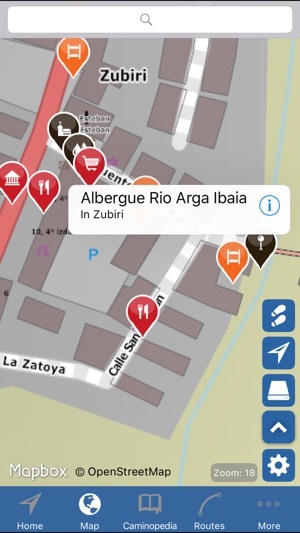 Review and rank albergues, flag locations of interest, add your own notes, and more. TrekRight’s content is regularly updated and expanded based on the latest information available to us. You can check for content updates directly inside TrekRight and download our database whenever it is convenient for you (even on the trail), without having to connect to the App Store. Always be up to date! All of TrekRight's content is stored directly on your phone, including our detailed offline maps. No Internet connection is required! Hey everyone. This update includes a major update to our Camino Francés content as well as some small tweaks to the app itself (mainly improvements to the maps). Thanks to everyone who sent in feedback – much appreciated! Buen Camino! I just finished walking the Camino de Frances on June 30, 2018 and was highly impressed with this app! The maps were so helpful when WiFi was not available as they work offline! 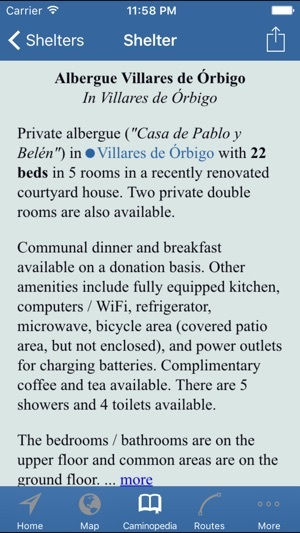 Additionally, I found some great albergues and hostels to stay at! 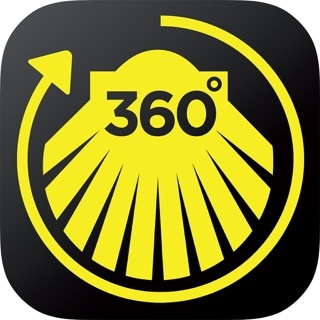 I recommended this app along the Camino to several pilgrims! Thanks for the very nice review! 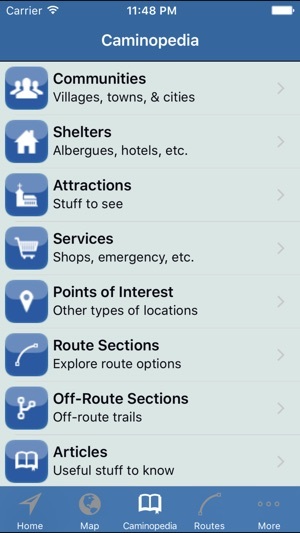 I'm glad you found the app helpful during your Camino. Please contact us and let us know about anything you think we should change, add, or improve in the app -- we're always trying to make it better. And if you have suggestions on other long-distance routes you think we should cover, we'd love to hear about them. Safe travels! 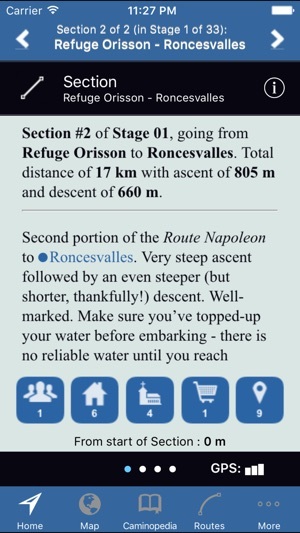 Great App for the Camino! Kept me from getting lost on more than one occasion. Also helped me locate lodging. Excellent maps! You can’t change the route sections. If you can there are no clear directions. While walking it does not provide much in way of guidance. Most expensive app on El Camino provides zero utility. Hi there. I'm sorry you didn't find TrekRight suitable for your needs. If you contact me by email I can assist you in using it. You are definitely able to change the route sections (they are highly customizable, actually). The built-in yellow arrow points the way to walk based on your current location and your chosen route. There are walking directions and notes about attractions. Progress stats are available showing distance completed and remaining for your current section, stage, and route. The offline maps have hill shading and contour lines to show you the terrain you are going through. And more. We're very responsive to all feedback and are always happy to help if you have any questions.